FCVC does not provide animal services for donkeys or horses. 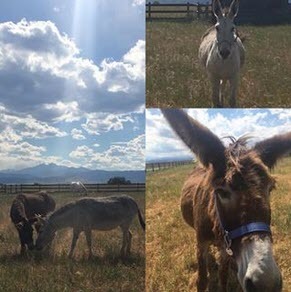 However, as a veterinarian we can recommend the Longhopes Donkey Rescue and Shelter as a wonderful rescue facility that takes care of their animals and as a place to adopt, sponsor, donate or volunteer. Recently Dr. Mahoney adopted two rescue donkeys from the Longhopes Donkey Shelter. Their pictures are here on the left. So who is Longhopes Donkey Shelter? The Longhopes Donkey Shelter was incorporated January 2000, but began in 1998 when the founder, Kathy Dean, went looking for her own donkeys. She knew there were unwanted donkeys needing homes but she was unable to find them, because unwanted donkeys were usually sold for slaughter at local sale barns. Wanting to offer an alternative, Kathy learned that rescuing donkeys was impossible without a facility where the donkeys could be rehabilitated and trained until a new owner was found. In August 1999 Kathy and her husband Alan Miller bought 20 acres in Bennett. That month Kathy took in Rocky, a 42-year-old donkey whose owner could no longer keep him. By January 2000 Kathy had 9 donkeys. That was when Kathy decided to formalize her passion and create an equine shelter to serve donkeys in the Rocky Mountains. Longhopes is managed by a non-compensated Board of Directors. Meet Longhopes Directors. A healthy donkey needs the companionship of at least one other donkey. Donkeys have an incomparable ability for rehabilitation and affection. No donkey should be bred until all existing donkeys have homes. We must all be part of the solution to the overpopulation of animals. The lives we create lives we create lifetime responsibilities. A “No-kill” shelter must provide humane euthanasia to stop suffering. Longhopes has rescued over 1000 donkeys and placed over 930 in adoptive homes. Longhopes was the first U.S. donkey shelter to be accredited by the Global Federation of Animal Sanctuaries. We are also a member of the Colorado Nonprofit Association. Please help us care for the donkeys with an online donation or merchandise purchase. Use either Colorado Gives, PayPal (Both accept all major credit cards) or send a personal check directly to the us. Did you know that your donation may be tax deductible. Ask your tax professional for details. Open by appointment only. Please call (303) 644-5930 to arrange for a visit. In our next We Talk Pets blog post – Rescuing Donkeys: Longhopes Donkey Shelter & Adoptions, we will talk about ways you can help the Longhopes.